The first in this popular Canadian series opens when Andy Boychuck, just elected leader of Saskatchewan’s provincial official opposition party, begins to give a speech at an event to celebrate his victory. Before he can say anything, he takes a drink and collapses on stage. Joanne Kilbourn, his speechwriter and friend, dashes to the body but is unable to revive him. She does, however, stop Andy’s press secretary from drinking from the same tainted source. From this chaos we learn more about Joanne, a 45-year-old widow, and her three children, her friends and her dedication to the political group surrounding Andy. Joanne is still mourning her husband Ian, so Andy’s death brings back strong memories for her. As a result, she decides to write a biography of her dead friend – a decision that is, unknown to her, a dangerous one. By this means, the author conveys an absorbing sense of life in this province, in particular the small clique of workers dedicated to their party’s cause. Andy’s wife Eva has a life independent of him and his political circle. At the start of the book, Joanne joins in the general condemnation of Eva for her lack of commitment to Andy’s career. I, however, sympathised with Eva from the start, so I was pleased that Joanne comes to realise that her group’s irritation with Eva for, for example, wanting her husband buried according to her own wishes rather than for political reasons, is inappropriate. Eva is a key to the mystery of Andy’s death, which Joanne gradually comes to realise has its roots in Andy’s hidden personality. It isn’t difficult to guess the identity of the villain, and one downside is a mysterious undiagnosable illness that turns out to have a diagnosable explanation: but these minor flaws don’t detract from the many strong points of the novel. It is a great portrait of a family and community lifestyle set against the darker secrets that reach back into the past of quite a few of the cast of characters. The Canadian setting, as well as the tight political circle of Joanne and her close associates, is convincingly conveyed. Deadly Appearances is a most engaging read. I purchased my copy of this novel as a composite edition of the first three Joanne Kilbourn novels. Read another review of this book at Mysteries and More from Saskatchewan (where it is revealed that Andy is based on a real politician!). In the Spotlight: Margot Kinberg writes an insightful analysis of this novel. Q/A with Gail Bowen at Mysteries and More from Saskatchewan. Author’s website, including details of the Joanne Kilbourn series in reading order. Sounds interesting Maxine – you are on a Canadian crime reading spree. I like the idea of a political angle and if it is based on a real politician so much the better! Thanks, Sarah – I’m finding Bill’s blog a great source of reading material! Maxine – I’m so glad you really enjoyed this! 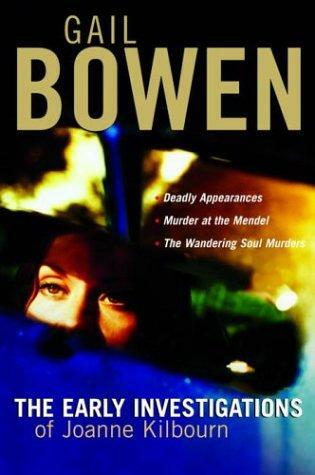 In my opinion, Bowen does a very effective job with depicting the setting and the community, too. I also happened like balance she strikes between Kilbourn’s home life and the mystery of Andy Boychuk’s death. Another thing I thought worked quite well was the way Bowen describes the different kinds of communities, particularly the Ukrainian-Canadian community in Saskatchewan. Thanks for this excellent review and thanks for the link to my blog. Thanks, Margot, I also thought the religious/spiritual community was done quite well – an unusual lifestyle for so many young people to choose. My thoughts exactly, Maxine, and yes, that religious community really is interesting. Bowen does an honest, respectful and illuminating job with that I think. Thanks for this review. I have this book, thanks to a kind blogger and will start it soon, although my TBR pile is daunting. I started reading The Invisible Ones and couldn’t get into it, however, I just saw your rating and review and restarted it and am finding it quite interesting. So, here’s hoping I continue at this level of involvement — and again, with the Roma people, friends will also want to read it. Nothing like fiction, especially crime fiction, as a learning tool. Agreed, Kathy, it teaches you a lot about the world and its cultures, micro and macro. Maxine: It is a lovely Sunday Saskatchewan morning. To find a fine review of a book I have enjoyed was nice. For the review to like one of my favourite Saskatchewan authors was even better. To have kind references to my blog made it great. I hope you will keep returning to Saskatchewan mysteries. Coming back for the rest of Canada is also good. Thank you, Bill, and as a result of your excellent recommendations, I am sure I shall! I’ve just been poking around on Amazon to see if any of Gail Bowen’s books are available on Kindle. There’s an omnibus edition containing three, but not this first one. I must go and read Bill’s blog as well. I’ve read some Canadian crime fic – I liked the series with the female ice hockey reporter (grr, gone blank on the author’s name!). And I’ve enjoyed most of Anthony Bidulka’s books, although they’ve got a bit like sitting through his holiday snaps! Sharon, were you thinking of Alison Gordon? (Baseball rather than ice hockey).